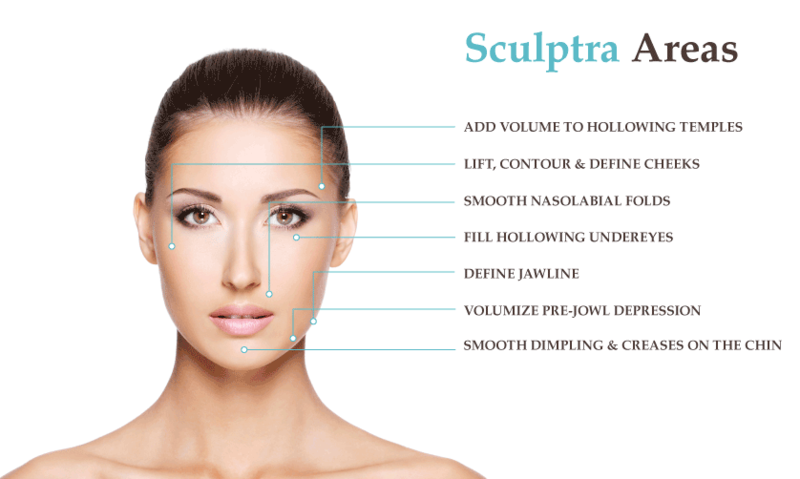 Sculptra is not an overnight miracle or quick-fix. Itis a long lasting facial injectable that gives you subtle results over time. Stimulating and replacing lost collagen, giving you a more natural-looking appearance, without giving you away or changing one’s look. A full treatment of Sculptra is an average of three injection sessions over a few months and can last more than two years. You have more time for the effects to be subtle. Sculptra is a new type of facial injectable made from poly-L-lactic acid, which helps to replace lost collagen for areas on your face (smile lines and chin) and body. It helps correct shallow to deep facial wrinkles, and folds, that appear with aging by replacing lost collagen. The main ingredient is a bio-compatible, biodegradable synthetic material that has been used by physicians for decades. Is it bio-compatible and bio-degradable? Sculptra Aesthetic is made from a synthetic material called poly-L-lactic acid, which is gradually and naturally absorbed by the body as it works to replace lost collagen. Poly-L-lactic acid has been used for decades in dis-solvable stitches and as a facial injectable since 1999 in over 30 countries.